Admit it – you’re a coffeephile. For you, java heralds the onset of the day, and many times, gets you through it! In consideration of the many coffee lovers out there we created Espresso Yourself, a delicious assortment of cookies, chocolate and coffee itself, all of which embody the wonderful world of café! We’ve combined the best organic and natural snacks, fair trade coffee and a beautiful earth-friendly ceramic mug, all in a simple, reusable metal pail, designed to bring a glint to the eye of the most worldly, sophisticated coffee lover. This is the ideal organic gift for you or anyone dear to you who considers coffee the elixir of life! 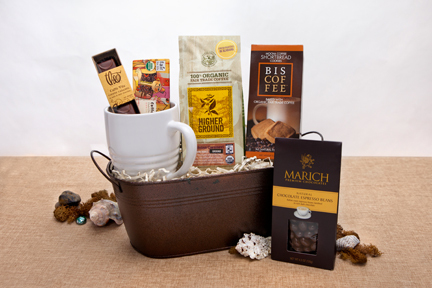 More than just a gift basket for coffee lovers, there’s no better way to let the java junkie in your life know that you’re thinking of them, as well as the Earth!